I'll be honest, this probably isn't a book I would have normally went out and purchased, however, I received an ARC of 'The Wish Granter', book #2 in the Ravenspire series, and sequel to 'The Shadow Queen' and I was intrigued enough to give the series a try (great marketing by Balzer + Bray). I opted to go with the audio version on audible which is my preferred format for reading high fantasy, especially book 1 in a series containing unique names and places with difficult pronunciations that would slow me down where I reading the hardcopy. The narrator, Khristine Hvam, did a good job, not a great job, I would have liked to see a bit more of a range of contrast when narrating the different characters, especially the villain, but overall she captured the essence of the story and sufficiently gave it a life and a voice. I would listen to her narration for other books in the future. 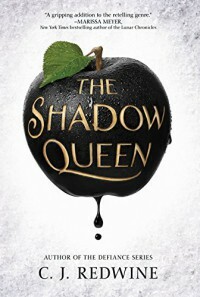 The Shadow Queen is a retelling of snow white in which Lorelai, the teenage heroine escaped the wrath of her evil aunt turned stepmother, Irina, when she was a young girl. Irina has assumed that both Lorelai and her younger brother, Leo, were killed along with their father when I Reena bewitched the kingdom and took over the crown. However, rumors of Lorelai's existence cause Irina to negotiate a blood oath with Kol - the young and newly appointed king of Elder, who has the ability to transform from human to Dragon at will -to hunt down Lorelai the rightful queen of Ravenspire, and return with her heart. The blood oath ensures that if Kol fails at this mission he will die but if he succeeds Irina has agreed to use her magic to save his people, the kingdom of Elder from the certain annihilation brought on by an opposing force that is quickly closing down upon them. To guarantee his cooperation, Irina takes Kol's human heart as collateral, leaving him with only his predatorial dragons heart, as she sends him out to do her bidding. Will Irina succeed in destroying Lorelai, the last and only threat that could take away her crown and reclaim her birthright as the queen of Ravenspire or has Irina greatly underestimated the strength and power of Lorelai's magic and the loyalty of her friends and followers??? Overall, I rate this story with 3.5 stars. It wasn't my favorite book of all time but it wasn't horrible either. I found the characters to be a bit flat and the storyline was quite predictable, but considering this was a retelling of a fairytale I guess that was to be expected. It was entertaining enough but lacking in any real substance but I will continue to read C.J. Redwine and look forward to book 2 in the Ravenspire series, The Wish Granter, said to be a retelling of Rumpelstiltskin and from what I can tell from the synopsis, has completely different characters altogether, which is a bit of a disappointment in my opinion. I definitely highly recommend the audio version opposed to the regular print version of this book.